Mix both sugars, cinnamon, raisins and nuts together in a bowl. Working with one round of dough at a time, spread 2 tbsp. of preserves on one round. Then sprinkle with 1/2 cup of the filling. Lightly press into the dough. Cut the circle with a pizza cutter into 12 equal wedges – cutting into quarters and then each quarter into thirds. Starting with the wide edge, roll up each wedge. 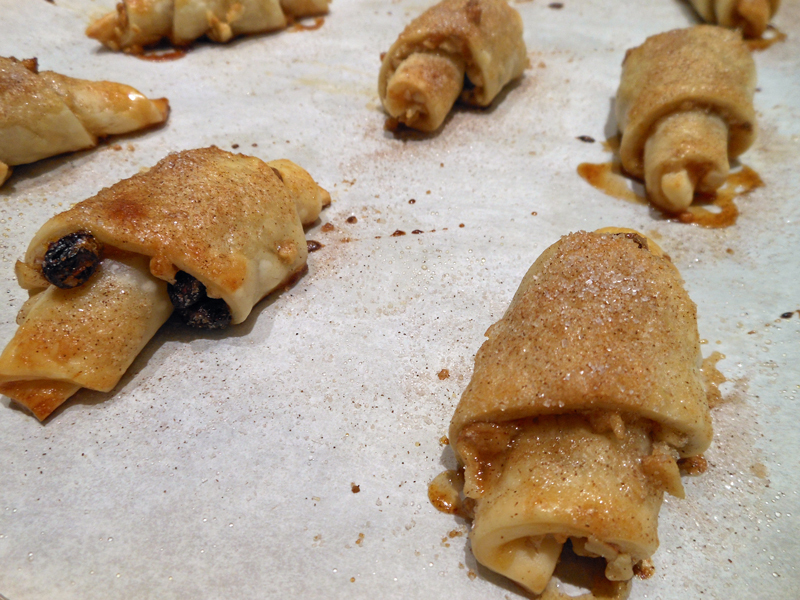 Place cookies, points tucked under, on a baking sheet lined with parchment paper. Mix egg and milk together for egg wash.
Bruch each cookie with egg wash. Combine 3 tablespoons sugar and 1 teaspoon cinnamon and sprinkle on the cookies. Bake for 15 to 20 minutes, until lightly browned. Remove to a wire rack and let cool. Repeat with remaining rounds of dough. You should be able to get 2 dozen cookies on one baking sheet.